Have you ever admired an actors ability so much that you’ll watch anything they are in? For some reason, there is a gratification button that flashes read every time you remotely enjoy a thing and/or person, and it spirals you out of control. If you’ve never experienced this with an actor, think about a soap you love, a sport, perhaps, or simply something that you cannot get enough of. For anyone who has had that obsessive need to shove everything an actor has ever done into your eyeballs, you’ll have had to sit through some utter dross because of this compulsion. If you’ve bounced around this site or my space for vast periods of time, you’d have noticed that my particular actor is James McAvoy. And I’ll be damned if I don’t watch everything he’s ever been in. Ever. Which is why, my friends, I sat through the garishly strained, deeply unnecessary, and overblown cash cow that is Sherlock Gnomes. Now, in spite of my want for a deeper and enriched understanding of cinema, I actually have a guilty pleasure for the original garden gnome based adventure Gnomeo & Juliet. It consisted of hilarious back-porch puns, some cheesy music, and Patrick Stewart as a Shakespeare statue. Sadly, these qualities aren’t transported alongside the Gnomes as they are ousted from their beloved garden and thrust into the hectic world of London. Whilst there, they are betrothed as the new rulers and have to bring the garden up to standards. With Juliet obsessed with getting this absolutely right, Gnomeo feels displaced and ignored. He’ll have to reconcile his feelings fast as the entirety of their friends are kidnapped. The only person who can solve this mystery is a dear-stalker wearing genius named…you guessed it…Sherlock Gnomes, alongside his long-suffering right-hand man Watson. Can the quartet solve the mysteries and hope to find the missing gnomes? Look, it’s very easy to sit there and say “it’s meant for kids, stop being so critical.” Too easy, one might say. After all, Sherlock Gnomes has the right amount of sickly colours and mindless story-lines to entertain your children for however many minutes. That is until they get bored around the hour mark and start getting distracted again. You can easily just dismiss this film as a family friendly outing that we shouldn’t be looking at too seriously but, my lord, don’t our children deserve better? Look at Moana, Coco, Kubo and the Two Strings, or Mary and the Witch’s Flower, these are just immensely popular films that attract swathes of people to watch because not only is the imagination impeccable but the storyline is clustered with characters and growth. They tell morals and stories, spiralling with imagination and vibrancy. With patronising in site, these movies are inventions – teaching children about adventure, spirit, and gusto. There is no wonder that Disney are monopolising the market when nearly every feature film they produce for the big screen is received with such fervent admiration. They layer their movies with magic, empathy, and understanding. Sadly, this isn’t the case for Sherlock Gnomes. 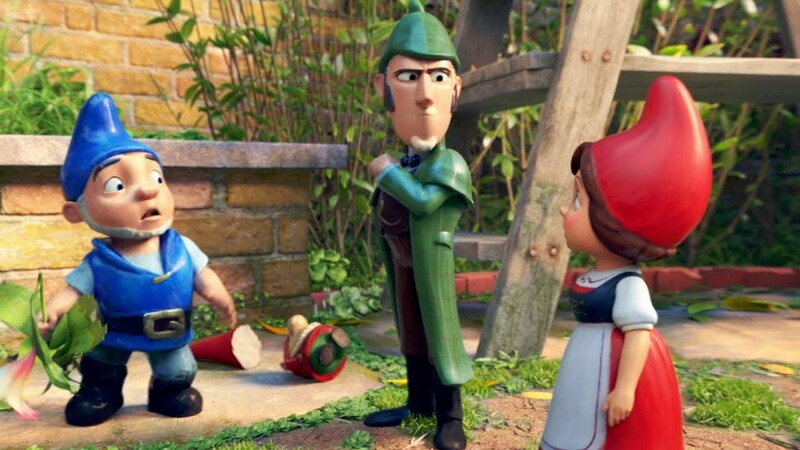 The movie Sherlock Gnomes is unsightly mess of a film that runs amok with substandard puns and a severe butchering of what little allusions they have to classical literature characters. It feels phoned in and disgracefully made purely to line studio head pockets as families enter in drones. Oh, and, for Elton John to feel each pound of royalties as his songs are sandwiched awkwardly into the soundtrack as well as the dialogue. To make it worse, the film is deplorably dull and vacant of any heart. It’s a disappointing feature film that can’t even match the spirited and silly vibe of the first outing. Sherlock Gnomes is out on DVD & Blu-Ray!